“BenjaPakee” is actually an ancient word from Pali. Benja means 5 kind or type, Pakee means set or grouping. So BenjaPakee means 5 different types of amulets in a group or set. Benjapakee is the most wanted amulets for collectors with the best Buddha art, story, legend, bless and the purpose. Thai people usually wear or keep in Dharma room (praying room in house). For real believer that pray, Benjapakee give them good fortune, protect from danger or even have better success in business or any good purpose. The only reason in an old time that Benjapakee change owners is an estate. In present there much more information and story for knowledge. Which bring up many people that have the same passion for Thailand amulets from internet, market, or individual to collect Benjapakee. Even exchange with high values, nowadays as time pass the values of Benjapakee keep raising. 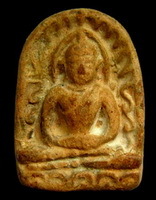 of the most famous and the best amulets from Thailand. Phra Rod was created by a hermit. First discovered during the earlier days of King Rama 5 reign when a pagoda from Wat Mahawan in Lumphun province. 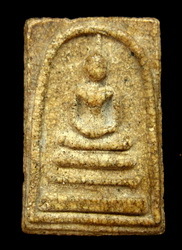 The Thai people regard this particular amulet as Buddha of Escape, they have superb Buddhistic power, especially in protection and being safe from all dangers and disasters or misfortunes. They are made of clay and the oldest once are over 1,250 years old. very famous for bless strong with attractiveness and respectful from all others, also power on charm and safe from all dangers. "U-thong" art style. Most of unique of this amulets is at the back had a thumb print of the creator. A superb Buddha amulets had all mighty protective power against weapon and bring good luck. Is the most powerful amulets of ever.